Since there was no 10am service at St. Julian’s or the guesthouse this morning, I decided to go to the 11am Holy Eucharist at the cathedral. When I arrived I checked which of the side chapels was being used and found out it was the Jesus Chapel. It’s small (of course) with curved stalls along the wall. When I arrived there were already about ten people there, and it seemed as though about half of them were regulars, the other half visitors. Most of them were elderly. I found a place to sit and found in front of me my old friend, the 1662 Book of Common Prayer. There was just time for me to find the right page before the priest, verger and one other man in a cassock entered the chapel and began the service. It was not the most uplifting of experiences. The celebrant launched into the service without announcing the page number, and proceeded through the service without any reference to where we were at in the book. The third man of the trio read the lesson, in such a halting way that it seemed he hadn’t read it ahead of time. As was pointed out to me later in the day, the Eucharist is still a sacred and moving act of worship, no matter what surrounds it, and I am glad I went. Norwich Cathedral is beautiful and I enjoyed having the opportunity to worship there and have another look round. What disappointed me was the perfunctory nature of the service, the disconnect between the priest and the people assembled to worship. To not announce the page numbers, to go through the motions when you are in a place of pilgrimage and sight-seeing, when the possibility of visitors or people new to the service must be high, seems a particularly unwelcoming way of going about things. In York Minister, I have found that the priest who has celebrated the Eucharist generally stands outside the chapel and greets people as they leave, but today the three men left the chapel and that was the end of the service. A breathtakingly lovely building, but a missed opportunity to really welcome people into the heart of the worship it has been home to for over nine hundred years. 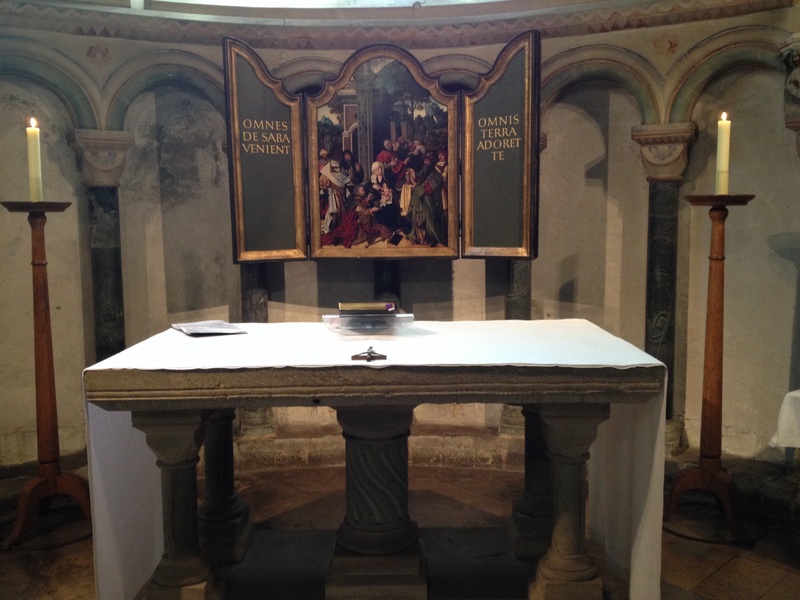 This entry was posted in Travel and tagged 1662 BCP, Book of Common Prayer, Holy Eucharist, Jesus Chapel, Norwich, Norwich Cathedral by tokyopurplegirl. Bookmark the permalink.